Pothole crews with the City of Penticton got to work this week, after one of the worst years in many, due to water main failures and a frigid winter. Crews will be working on a priority basis, focusing on high traffic areas first and working into side streets and residential neighbourhoods. It is estimated the majority of the roadways will be restored within three weeks. Major potholes have been getting filled with cold-mix asphalt all winter, but it only acts as a temporary fix in many cases. Meanwhile, roadways outside Penticton in the RDOS have been seeing their fair share of craters. 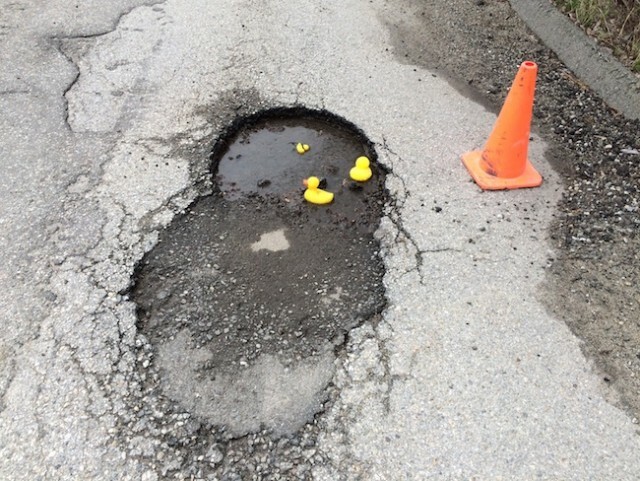 At least one pothole has grown so large on Naramata's Bartlett Road that residents have placed rubber ducks in it. All rural roads and road work are under the jurisdiction of the Ministry of Transportation and their contractor Argo, according to RDOS chair Karla Kozakevich. She said Argo will be out dealing with road sweeping and pothole repairs soon. Residents are encouraged to call Argo to report the potholes so they are not missed, at 1-800-663-7623.